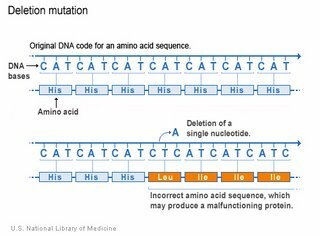 The deletion mutation eliminates one or more nucleotides from a DNA sequence, and may produce a non-functional protein. If the number of deleted bases is not a multiple of 3, then the deletion will cause frameshift, with potentially serious consequences. 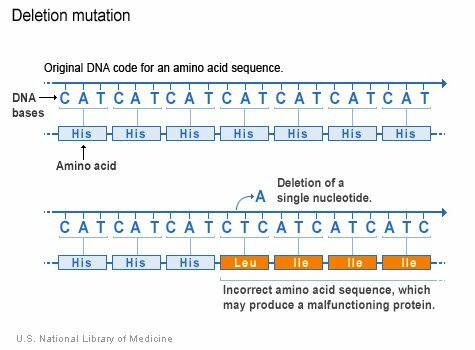 Deletion and insertion mutations often occur in repetitive sequences, such as deletion of "AT" from the sequence "ATAT" in the CFTR gene. Such mutations are most often caused by a "replication slippage", where the new strand mispairs with the template strand at repetitive sequences. Slippage can cause mispairing of several repeats. 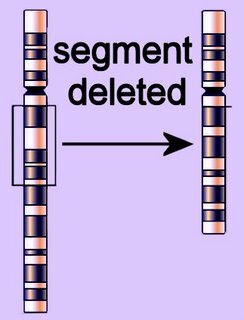 Forward slippage results in deletion mutations, while backward slippage results in insertions. Replication slippage is mainly responsible for microsatellite polymorphisms, which are also called short tandem repeats (STR). In microsatellites, the repeat unit comprises only 1 to 6 bp and the whole repetitive region spans less than 150 bp, while minisatellites range from 1 to 20 kb, and satellites span from 100 kb to more than 1 Mb.